Note: Intended to be posted back in February. Pretty cool, huh? Chip is estimating that there are 4,000 board feet from all the lumber (see the last photo for a picture of all the lumber milled). What the heck is board feet? Good question - I'm still having trouble wrapping my brain around it but I'll do my best to explain. One board foot is 12" x 12" x 1" and you can manipulate those numbers based on the thickness and width of the wood you want cut. That was easier to explain than I thought; it just seemed more complicated when Chip was asking me to complete board feet calculations in my head. Ask me to figure out a 60% discount at a clothing store and I'm your girl but computing math calculations off the cuff for something I don't understand and I'll be the last person you want to ask. Prior to milling the wood, Chip talked about buying a portable sawmill from Harbor Freight and doing it himself and then his idea snowballed into entrepreneurial pursuits; hauling the mobile sawmill and sawing logs all day. Focus honey, focus. 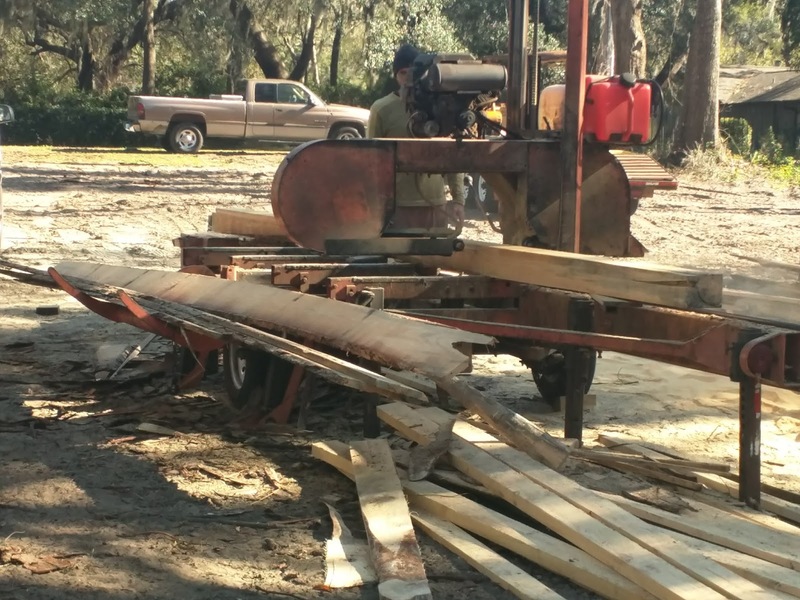 He called mills and mobile sawmill companies to price it out and after much debate he ended up hiring a father/son duo to saw the wood. Thank goodness because I just kept thinking, where the heck is that hunk of machinery going to go, oh yeah, that's right, right next to our bull dozer because that's what everyone else does. The duo milled the logs for the next few days. 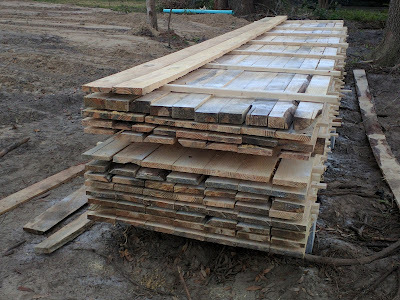 To me, the cut wood looks great and ready to use but when the logs are sawed they are actually rough cut. The next step is to prep the wood so bugs and the weather don't damage it - this weekend and the next, we'll be putting a solution all over each board and then covering it up. Then we wait - for a year, while it dries out. Below is one type of wood boring beetle. 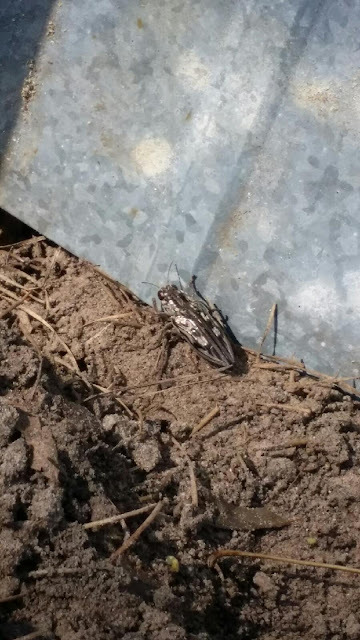 This big bug, and his buddies, were a buzz while we were working. I was grateful to see birds hopping about on the boards in search of beetles. The final four stacks of wood: The back left stacks are over 6' tall, with 8' boards on the far left and 13' boards on the back left. 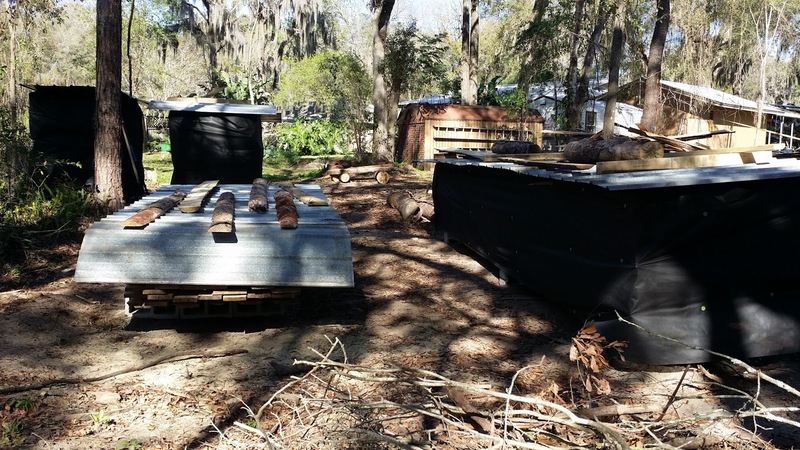 The front stack is 3' tall and has 13' boards and the front right stack is 4' tall with 20' boards. Once the wood is dried out, then the wood will need to be milled (i.e. smoothed down, this will end up taking a quarter of an inch off on all sides). Whether we buy the equipment to complete the last prep stage or hire out is to be determined. 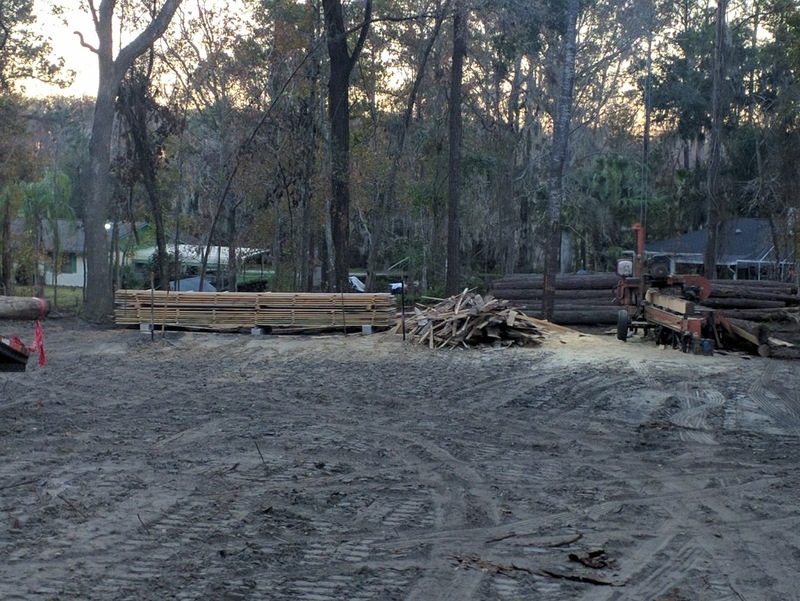 Either way, when the wood is milled it will be ready for use and we hope to use the wood is as many ways as possible in The Floridian.